← Exception to Several Theories of Aging – Why Do Naked Mole Rats Live So Long? This is Dale Bredesen. He is a big specialist in neurodegeneration and Alzheimer’s disease. I met Dr. Bredesen during the Buck Advisory Council meeting at the Buck Institute for Research on Aging in Novato, California on May 21. Advisory Council consists of influential individuals who can contribute to Buck Institute’s mission of advancing aging research. A very interesting crowd. I enjoyed the conversations a lot. Also there were several talks by the lab leaders at the Buck. 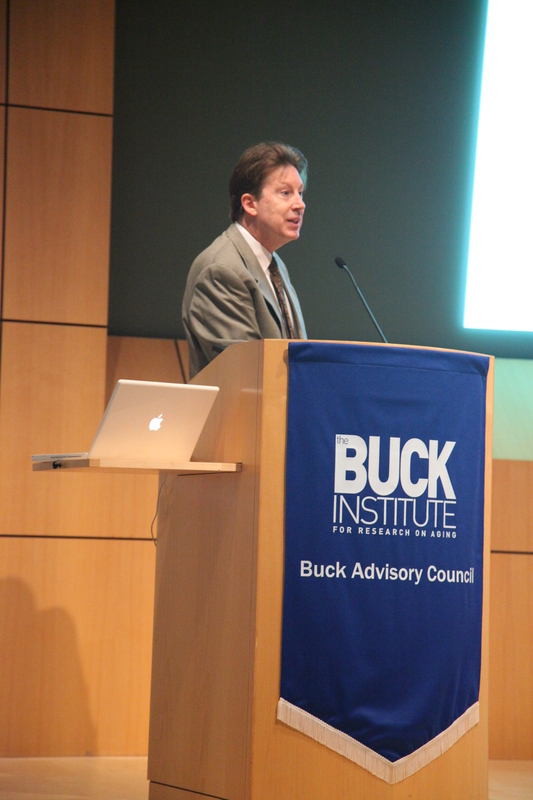 Dale Bredesen opened the mini conference with his report on Alzheimer’s research. The majority of scientists envision this horrible degenerative process as accumulation of toxic molecules, namely amyloid beta and tau proteins. Amyloid beta forms plaques between the cells and tau protein – tangles inside the cells. These toxic proteins disrupt the functions of our neurons. That’s in two words. So, Dr. Bredesen views Alzheimer’s disease differently – as an imbalance between synaptic maintenance and synaptic reorganization. The thing is that for our brain to function properly we need to form connections between our neurons, and also we need to break down those connections that we no longer need. According to Dale Bredesen, this balance disrupts, it shifts towards synaptic reorganization, we loose our memory, face the horrors of loosing our consciousness and eventually we die. By the way, there are 5 million Alzheimer’s patients in the US now, 30 million in the world and there will be 160 million people suffering from Alzheimer’s in 2050. That’s more people than we have in Russia right now. So how can we preserve this balance? Dr. Bredisen’s lab studies the underlying mechanisms of neurodegeneration. There were able to find out that one of the things that contributes to the balance shift is the change in APP cleavage. APP is amyloid precursor protein. It is concentrated in synapses of our neurons. APP can break down into either two, or four parts. When it breaks down into 2 parts those proteins are sAPP alfa and CTF alfa. This is a “good” combination. However, during aging amyloid precursor protein cleavage shifts towards the “bad” combination, which is sAPP beta, Amyloid beta, Jcasp and C31. This is the shift in balance that leads to the onset of disease. The shift can be restored. The mouse strain that has one mutation that leads to not having APP to break down to Jcasp and C31 proteins leads to restoring memory in mice. But the most exciting thing is that Dr. Bredesen is testing a drug that shifts the APP cleavage balance back to normal. The drug has already shown some promising results. Mice suffering from Alzheimer’s that got this F03 drug with their food were able to distinguish old objects from new ones, but not without the drug. I asked Professor Bredesen if we can detect the imbalance before we get the pathology, of there are some markers. He said that yes, this is possible, there are markers that can indicate the beginning of pathology development. Unfortunately at this moment they can only be measured in the spinal fluid, but there are labs that are developing blood tests. I believe this kind of research has to be the priority, because it can contribute to preventing disease and slowing down aging. very informative. thank you for the great article, i find it to be very useful :). Dr. Bredesen has published a case series (http://impactaging.com/papers/v6/n9/full/100690.html) which cannot get enough press – he used a functional medicine approach (Naturopathic-lite) to AD/MCI and published a case series. He has $3.5million in venture capital funding and UCLA/UCSF backing. He seems to be the lone voice in the research community for abandoning monotherapeutics for Alzheimer’s, which is a complex condition. Weaknesses of case series as a research method aside, I hope the buzz around his paper stimulates more polytherapeutic approaches! Indeed, I was very happy to learn the positive results of this recent study. It was small and definitely needs more exploration, however the comprehensive approach seems to be giving its results.